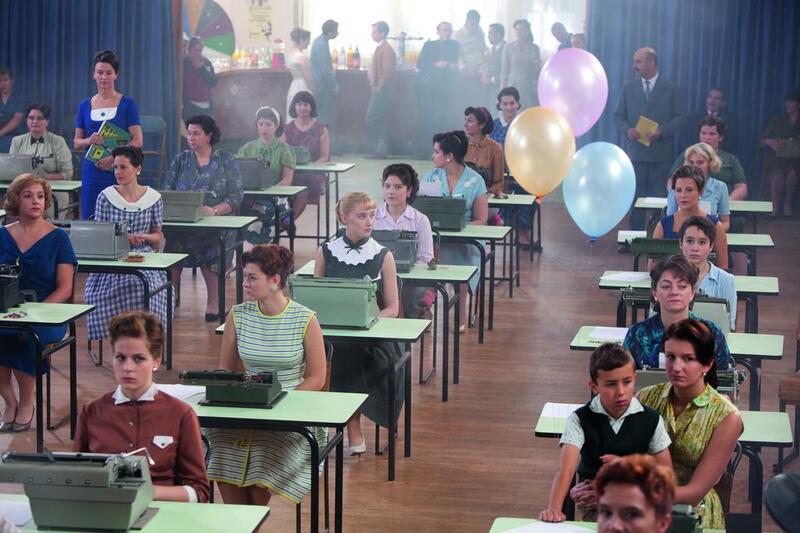 Did anybody see the sweet fluffy French film from last year called Populaire? It was set in the world of competitive typewriting in the 50s/60s, and actually inspired me to learn to touch-type, when I thought it was probably too late not having learnt it at school. Anyway, needless to say it's a great film for typewriter fetishists and it looks beautiful, but does anyone else have favourite movie scenes featuring typewriters? "...as if you could kill time without injuring eternity". Haven't seen it - nor even heard of it - but now I really want to! Far more important than the film, I'd love to get my hands on a Hermes Ambassador, which from the film stills appears to be the main characters choice in weapons. I love the variety of typewriters that were used in the film. In this still you can spot a Facit T2, an Olivetti Diaspron, an Underwood Master, and of course, the Olympia SG1, but I'm embarrassed to admit that there are a number that I don't recognize - at least not from the back. And what's with the woman in the second row using a portable?!? No wonder she looks concerned. It looks like she just figured out that she brought a knife to a gun fight. Like I said, it's a light, fluffy film but definitely enjoyable, and very French, and very chic, with a good soundtrack to boot. Enjoy! Finding the film locally might be a challenge, but I'm really glad you mentioned it; I hope it has subtitles! Next to a standard, a portable - even the best of them - just doesn't have the quality of feel in the type action, something that I'm sure is a critical performance characteristic for really fast typists. I don't know much about the typing championships that used to be held, but I think they were usually won on standard typewriters. That portable might only be there because the film's art director really went to great pains to avoid duplicating any models in that scene (I'd love to know the backstory for which machines were used for the film). It's quite comical when you compare the size difference between the lead character's Hermes and the portable being used by the woman in front of her. I just watched the trailer for this film on iTunes, and it does have subtitles! Looks like a lovely film. I forgot to add that I did see the film. As a typewriter collector I was in heaven; so many machines to look at and it was a lot of fun trying to identify them all. Whoever put the film sets together really did a good job mixing up the models that were being used, and because it was a French production, there were a number of typewriters featured that you almost never see on this side of the Atlantic. For example, I don't recall having ever seen a Japy typewriter for sale locally, and although there are plenty of Hermes models around, I've never seen an Ambassador, which was the star of the film. I'm glad Kasper mentioned the film because I definitely would have missed it. Wow, you're welcome! Really glad you enjoyed it... I still remember who introduced me to Raymond Chandler, so it's always nice to make a successful recommendation! Oh I LOVE 'Populaire'. Romain Duris, who plays her 'coach', is a really great actor - he also starred in one of my favourite thrillers of all time, 'The Beat That My Heart Skipped' - do look for it, it's insanely good and actually really moving. 'Populaire' was playing last year at my local cinema and of course I never saw it then - I fell for some cool reviews - but I've since bought the dvd. A really good solid old-fashioned romantic comedy, and it is really inspiring on the touch-typing front! I love how it's such a gorgeous pastiche of 50s graphic design and art direection. The scene in the hotel before the championship is a deep homage to Hitchcock's 'Vertigo'. Brilliant film. I have meant to watch Populaire; it looks very interesting. For my family any time a typewriter shows up in a movie we try to identify it on the spot. It's quite fun. The one that took me the longest to identify was the IBM electric in 'Polk County Pot Plane' (also known as 'In Hot Pursuit'), which is my favorite B-movie. I'm ashamed to say that identifying it took a few months.... It was at a strange angle. Close Encounters of the Third Kind has a deleted scene at a police station with a lot of typewriters in it, so if you have a special edition you can probably find the scene. Everyone remembers the Royal 10 from 'Misery' and the Adler Universal 39 from 'The Shining', and I spotted a Remington Portable No.2 in 'The Great Gatsby' (2013). Movies aside, the video game Bioshock has many typewriters hidden throughout the game. All of them are identical to Underwood No.5 desktops and are rebranded 'Belowtree'.